George Tabb endured the pain every geek, nerd and misfit encounters in adolescence, but he also had moments of triumph and revenge of which his peers could only dream. He writes about these experiences in a very real and funny way in his memoir, Playing Right Field: A Jew Grows in Greenwich. That’s no easy task, considering the extraordinary cruelty the budding young punk experienced at the hands of classmates, friends and, occasionally, his father and stepmother. 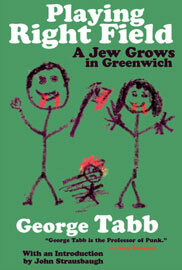 As readers of his Maximum Rock ’n’ Roll columns or fans of his now-defunct punk band Furious George already know, Tabb is not for the weak-stomached or easily offended. The two prevailing influences on young Tabb, who’s doing his best to grow up in his small Connecticut town, are violence and racism. He and his two younger brothers suffer near daily beatings at school for being the only Jews, and he takes a few more licks at home when he doesn’t live up to his father’s standard of a tough, independent son. He is robbed of his dignity, his lunch and, in one instance, some teeth as he faces a swarm of elementary-school kids armed with their parents’ ignorance and prejudice. But Tabb doesn’t go quietly. He earns grudging respect from a couple of bullies by beating them with his lunch box and pushing them out the backdoor of the school bus—while it’s still moving. Somehow, underneath all the blood and torture, Tabb weaves together dark and poignant comedy. The lighter moments—hanging out with his mom and her boyfriend, losing his fourth-chair trumpet spot in the school band— are equally vivid and anchor the pain. It’s almost hard to believe that all of this could happen to one child. But luckily for readers, Tabb remembers all of it and remains, then as now, an innocent kid at heart.